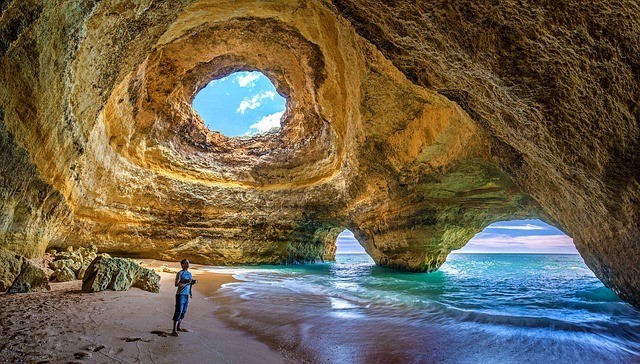 The Algarve is the most popular destination in Portugal for holidaymakers. And that’s no surprise when you consider everything the region offers. Even in the most developed resorts along the Algarve, you’ll find some of the most safe, beautiful and unspoiled sandy beaches to be found anywhere. The rocky outcrops, cove beaches backed by imposing red cliffs, and sand stretching into oblivion, are what characterise the Algarve’s coast. But it’s not just the beaches you’ll want to enjoy on a holiday to the Algarve. Inland, the region is relatively undeveloped. There are lovely towns and villages to visit on a day excursion, and the Roman ruins of Milreu – perfect for injecting a little sneaky education into the kids’ summer break! In the west, there’s the quaint spa town of Caldas de Monchique, surrounded by lush green woodland that leads up to the stunning Serra de Monchique mountain range, home to the eponymous Monchique mountain, the highest point in the region. Take a short boat trip to reach the five barrier islands and two peninsulas of the Reserva Natural da Ria Formosa. Recently elected one of the seven natural wonders of Portugal, the Reserva Natural is a coastal lagoon, comprising an area of some 18000 hectares. It’s a great area for birdwatchers, being one of the most important areas in the country for aquatic birds – and home to over 20,000 birds during the winter months. It’s not just birds, though. Endangered species find a safe home here. The chameleon, for example, and the Portuguese Water Dog. The Reserva is also home to one of the largest seahorse populations in the world. One of the Algarve’s most appealing towns is Lagos, and its fish market is a spectacle you won’t want to miss! The sheer variety will have your tastebuds tingling, and if you head upstairs, a luscious vegetable market provides an excellent range of accompaniments to add to your fish dinner! Speaking of markets, the Saturday morning market near the bus station is a great place to pick up some delectable local produce for next to nothing! Beyond the markets, however, Lagos is a charming town with a long and fascinating history, dating back to 2000 years BC. If you visit the older part of the town, you’ll still see the city walls which were constructed during the 16th century, and if you head down to Batata beach, you can see the 17th century fortifications at the Ponta de Bandeira. It’s all wholly fascinating, for those who want to learn a little bit about the history of their chosen holiday destination. Whilst the history of Lagos may be appealing to some, others will be more interested in the vibrancy of the town itself. Praça de Gil Eanes is a buzzing square in the middle of town, and is often the chosen setting for evening entertainment: from live musicians and street performances to a medieval fair, it’s a fun place to head to as the sun sinks for the night. Albufeira is one of the Algarve’s most popular resorts. It’s also perhaps the most developed. Nonetheless, it’s a lively, fun place to base your Algarve holiday. Firstly, those all-important beaches. Praia da Oura and Praia de Falésia are the more developed choices, and Praia de Galé for something a bit quieter. Next, some attractions. Let’s skip over Zoomarine with its questionable use of dolphins and other intelligent sea mammals as entertainment, and focus on the less morally objectionable Aquashow Park. Located in Quarteira, very close to Albufeira, the Aquashow Park is easy to reach either by shuttle bus or by car. Once there, you’ll find a whole host of waterslides for all the family: little ones for little kids, and big ones for bigger kids. Once you dry off, there are also some fun theme park rides, a Space Centre, museum and a ride called the Air Race, which mimics airplane manoeuvres and acrobatic moves – a real thrill! Finally, you can hardly mention Albufeira without talking about its famous nightlife. The Strip, and Bar Street, are the places to head to if you’re looking for a big night out. Things get steadily more wild as the night goes on, so time your visit according to your preferences. Of course, it all goes on till dawn, which means you can spend the next day dozing on a sun lounger! Situated at the south western extremity of the mainland, Sagres is another part of the Algarve with a long and fascinating history although it’s not particularly emphasised in the town. The main appeal of Sagres is its secluded atmosphere, fine beaches, and laid back vibe. Popular with surfers, it’s a friendly, cheerful sort of place, albeit a little cooler than elsewhere in the Algarve. Wherever you decide to stay in the Algarve, you can be sure of a holiday full of options to choose from. Accommodation is, of course, plentiful, owing to the sheer popularity of the region. Owning a timeshare here can be a very rewarding thing, as it’s unlikely you’ll find yourself bored: there’s always something new to be getting up to in the Algarve, and so much to explore. From couples or groups of friends on holiday for a good time, to families and older travellers looking for some good wholesome fun, there is something for everyone in the Algarve. Its popularity is no surprise to anyone who has experienced the wealth of charms this beautiful part of Portugal has to offer.